With a whole 3 days to spare, I have the last of my Christmas gifts finished. 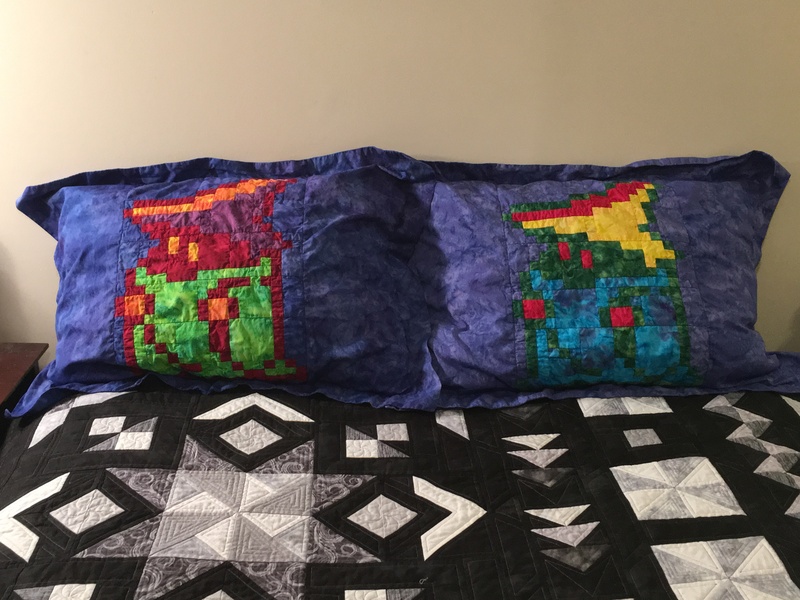 This year, I made two sets of pillow cases. The first is for my friend’s son who is obsessed with the Avengers. Next, is for my buddy who is obsessed with Spider-Man. I promised him a Spider-Man quilt when he graduated from college… and then I moved and ended up getting rid of the fabric. 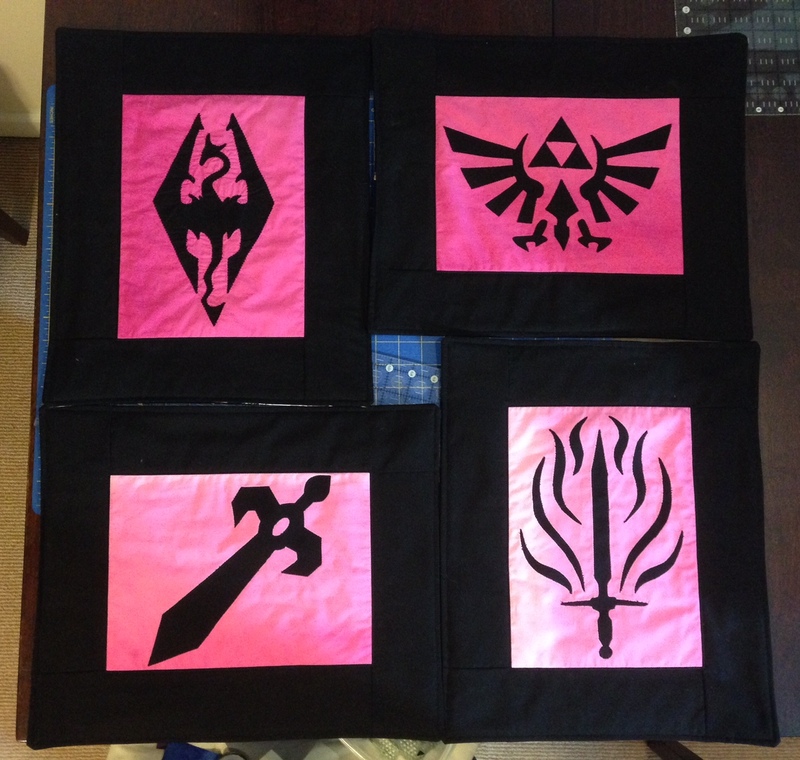 So though this isn’t a quilt, hopefully it will be close enough to what I promised him. I mailed my Mega Swap gift for the SpriteStitch.com swap on Saturday. It was going all the way to the UK, so I was expecting it to take 1-2 weeks to get there. It completely shocked me by arriving on Wednesday. And that means I can share the presents now. My buddy is BlackMageHeart who is one of the moderators for Sprite Stitch (no pressure). 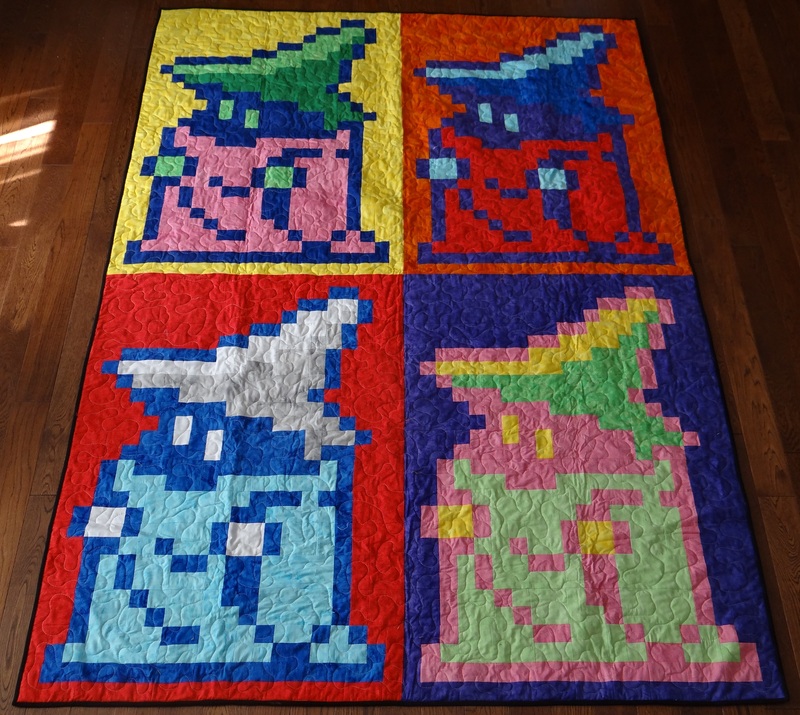 When I first saw her name, my first thought was to make a quilt with a Black Mage sprite from Final Fantasy. 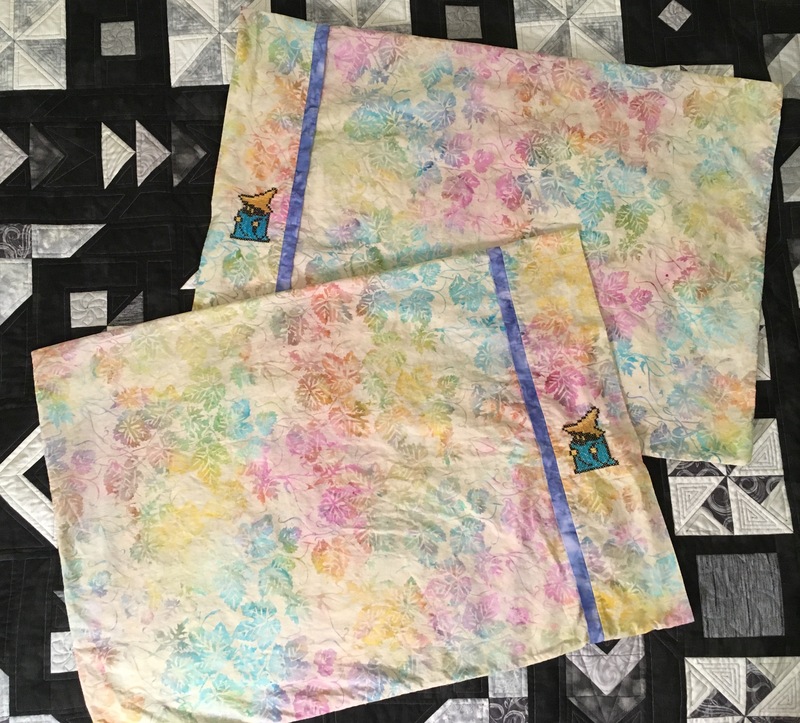 I was inspired by this quilt that Quiltoni made a few years ago… until I remembered the Quiltoni made it for BMH for the Swap a few years ago *face palm* I then got the idea, with Quiltoni’s permission, to make matching pillow shams. She sent me the sprite so it was easy to put together. I made 2 pillow shams. Quiltoni uses batiks so I tried to match her colors. It was also my first time making shams, and I’m very happy with how they came out. I inadvertently got a body fabric that blended in with the background for the one pillow, but I think it gives it a neat effect. In addition to the shams, I made regular pillowcases. 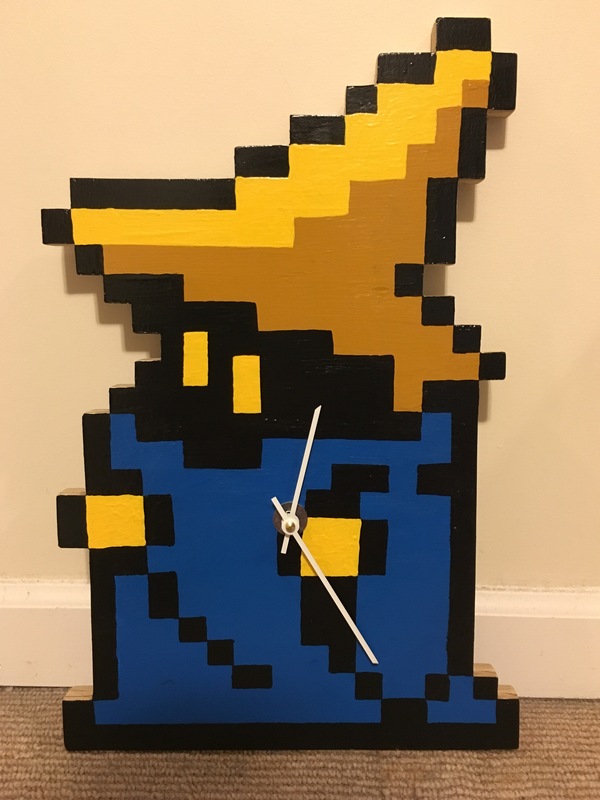 Lastly, I was trying to think what Black Mage items BMH didn’t have and I decided to make a clock. A buddy is a carpenter and gave me some left over cabinet wood. Another buddy has a jigsaw and cut out the outline. I painted it using acrylic paints. I bought a clock kit from Klockit where they provide you with the movement, hands, and nuts in one kit and you just need to put it together. Making a clock was a lot easier than I thought it would be. The clock is 12″ x 18″ which did require an expedition to find a box that would fit it. Last month, I went to PAX Prime* (!!!). My buddy scored tickets at the last minute and surprised me (and I had been having the worst week ever so it was extra special). 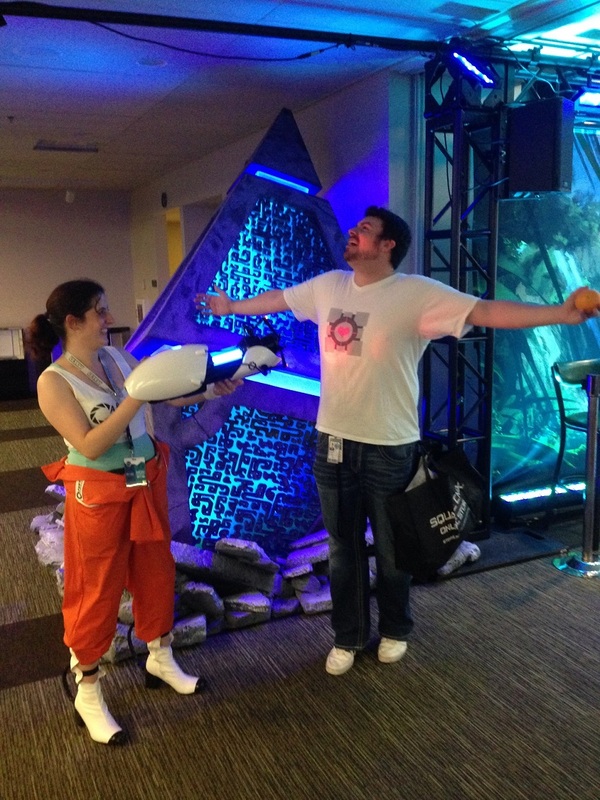 I had been wanting to do a Chell** cosplay for awhile, so this seemed like a good opportunity. Most of the items were purchased from Amazon. I made the boots with a tutorial here. And this is me. In the picture on the left, I have just used a portal to come out of the wall. I borrowed my other friend’s light up Portal gun (because of course he had a light up Portal gun… and it made the portal noises). Here are the boots up close. In the game, she uses a companion cube to assist while solving the puzzle. 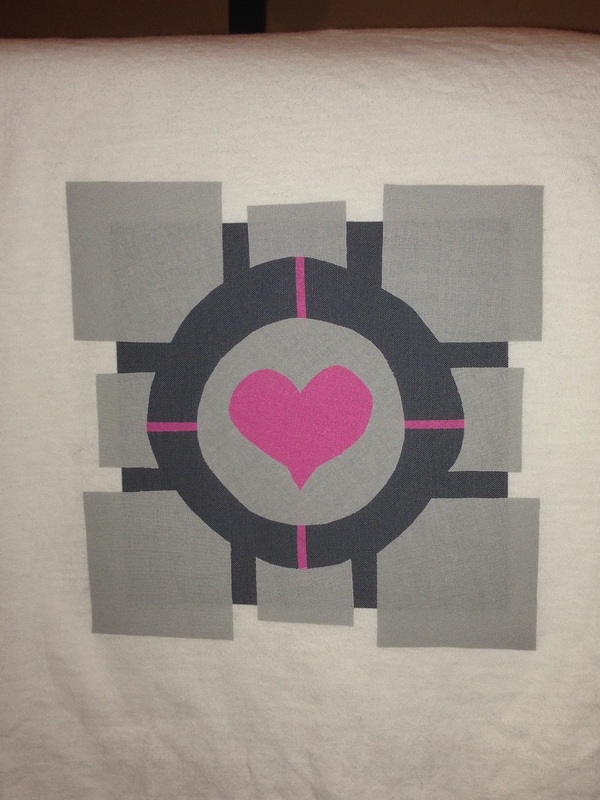 I made a companion cube shirt for my buddy, using fusible interfacing. It has the cube on both the front and back. In the game, she uses the gun to move the companion cube, so here I am moving my friend. Probably the coolest moment was when we were at the Alienware booth and the booth person had a Valve lanyard (Valve is who makes the Portal games). He said “you need this more than I do” and gave me his lanyard, which did complete the outfit. Including an Alienware pin (I love Alienware). *PAX Prime – Penny Arcade Expo. It’s a massive gaming convention located in Seattle that sells out in about 7 minutes. It’s sort of a pilgrimage that all gamers/geeks/nerds must someday take. This is the main convention in Seattle. There are 2 others, but it’s not like a Comicon where each city has its own. **Chell – Character from the video game Portal. It’s a puzzle game where you’re trying to get out of locked rooms. Chell uses her portal gun to create portals and go through walls/floors/etc. Her longfall boots allow her to safely fall long distances. I’m still here! This past month has been crazy and very little quilting has been happening. I did finish one of my gifts for my swap buddy on SpriteStitch, but until I finish her other gifts and she receives them, I can’t post pictures. 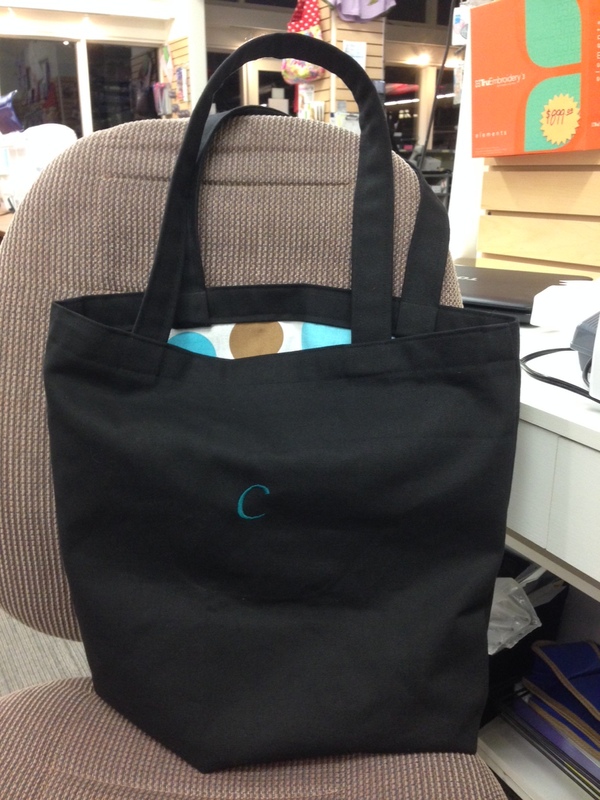 Yesterday, I took a class at Quality Sewing to make a canvas tote bag. I have very little experience in making 3D items (bags, clothes, etc). There was a Groupon for this class so I decided to take it. It was really fun and fast to make this bag. I was in the classroom for about 2 hours. They provided all of the material and we used their machines. The machine was a Brother embroidery and sewing machine and the first thing that we did was embroider our bag. 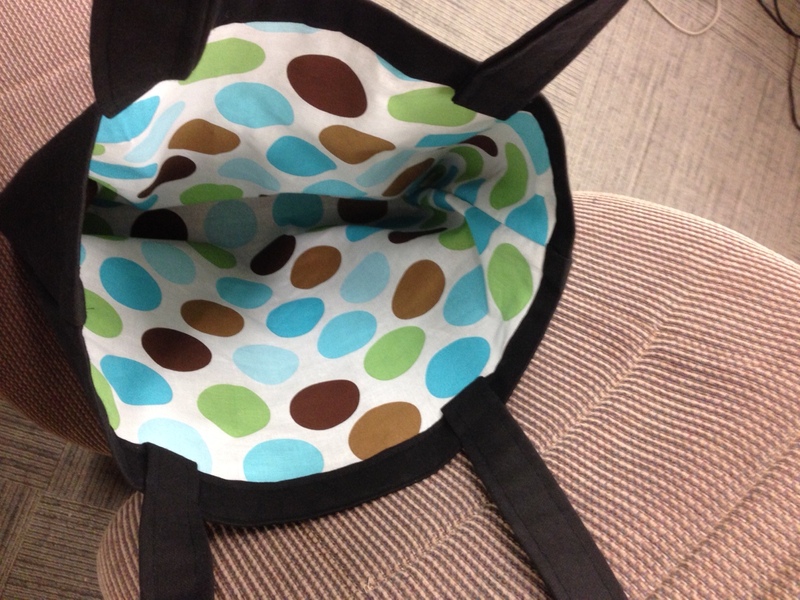 Then we switched to the sewing mode and assembled the bag. Even though I would rarely use it, I desperately want an embroidery machine now. I have a Bernina and before that a Husqvarna. I also had a Tin Lizzie longarm in my old life in Arizona. All of them have the presser foot lever behind the machine. I don’t know if it’s all Brothers or these machines in particular, but the press foot lever was on the side. The teacher said “lower your presser foot” and I was rubbing my hand all over the back of the machine and couldn’t find it! After about 30 seconds of me being confused and her saying “just put the foot down”, she had to show me where the lever was. I felt special. The weirdest thing was that the machines didn’t have a foot pedal. You press a button and it starts sewing at a constant speed. To speed up or slow down the machine, you move a slider. It was an interesting experience. When I sew, I’m usually holding my material really carefully and firmly to make sure it stays where I want it to be, so having to think that I needed to let go and move my hand to a certain button and press a certain thing to get it to stop was difficult. I much prefer the almost subconscious way I do that with a pedal. They also had regular pins rather than the silk pins which I use religiously. Since they were regular pins (thicker), we couldn’t sew over them. I had a “how do I sew if I can’t sew over pins?” moment and ended up sewing without pinning for most of the bag. You can also set the machine to automatically backstitch and cut the thread, which was pretty spiffy. And it told you when the bobbin was low. It was a great experience and a fun class, once I figured out how to use the machine. I’m thinking that everyone is getting a bag for Christmas. 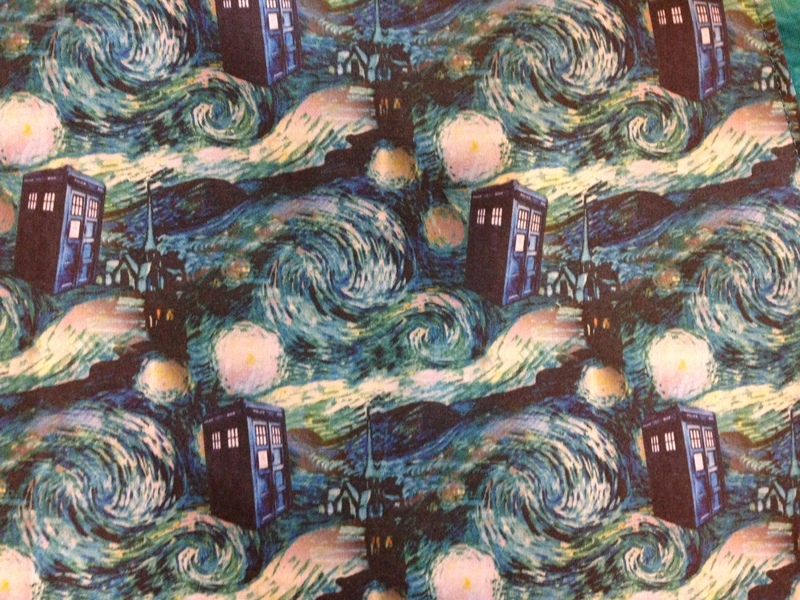 Remember in November when I bought Doctor Who fabric to make Christmas aprons? I ended up not making them in time and the fabric has just been hanging out… waiting… until my friend’s birthday. Since a Doctor Who apron is a much better birthday gift than Christmas gift … because of … reasons. 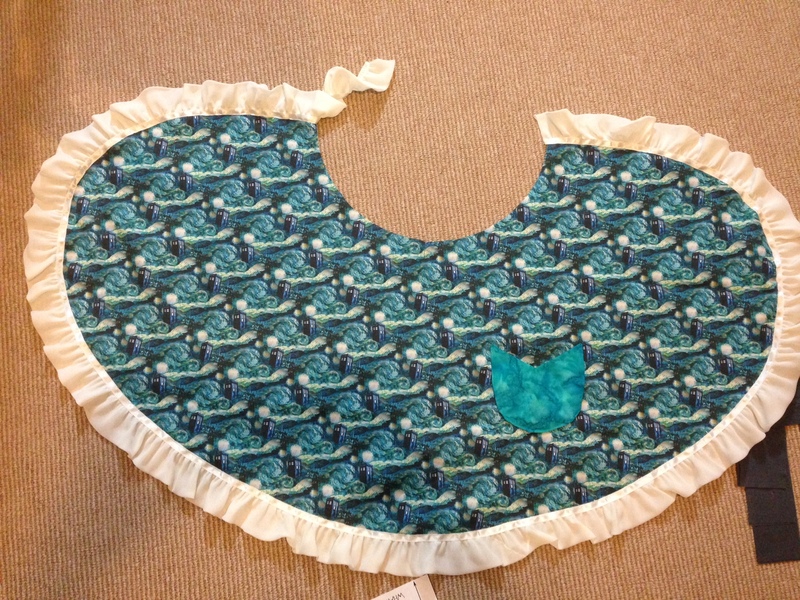 Anywho, I spent the day working on the apron. I got the pattern from WhatTheCraft.com and I don’t think I can rave enough about her patterns. I have extensive quilting experience, but almost 0 experience making clothes (and no experience making things correctly, just guessing). Her pattern says that it’s for beginners, but I had my doubts. Her instructions were so detailed and there were pictures for each step, it was so easy to make (all 80 steps of it). For the pattern, you get a 16 page file of the pattern pieces which you print on regular letter paper, tape together, and then cut out the shapes. And that may be a common thing but my experience is just the patterns on the light brown tissue paper so I appreciate her pattern being easy to print. 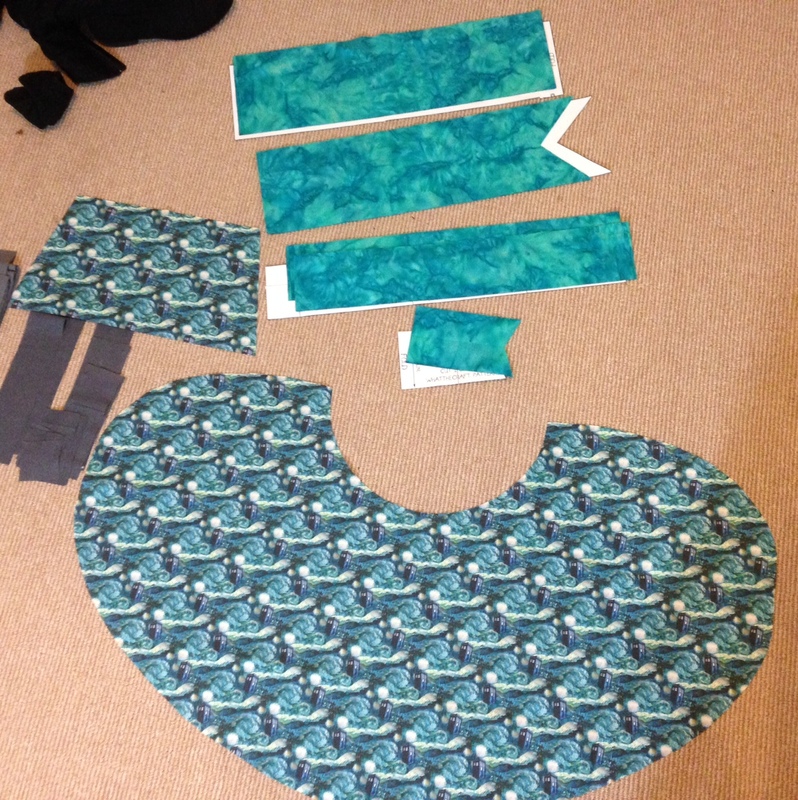 Here is the fabric cut out with the pattern pieces. I found a teal batik to match the colors in the Tardis fabric. 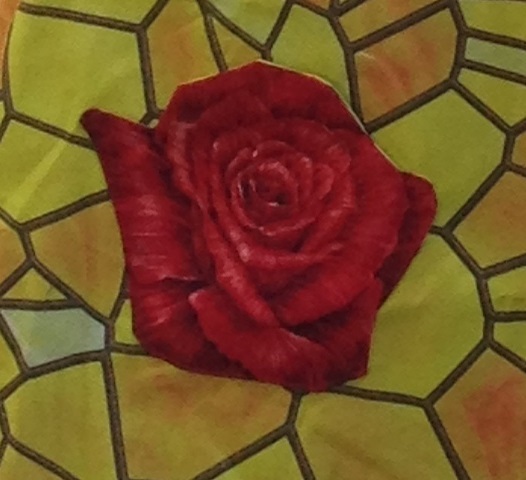 Close up of the fabric. I used a cotton poplin. It’s thicker than I’m used to (compared to regular cottons) and I was worried it was too thick, but since it’s an apron that will be used and washed, I think it’s an appropriate thickness. I got some off white ruffle trim from Joanns and made the skirt. Next up was the bodice, including some ruching at the top. And throughout all of this, I didn’t sew myself to anything! Not even once! 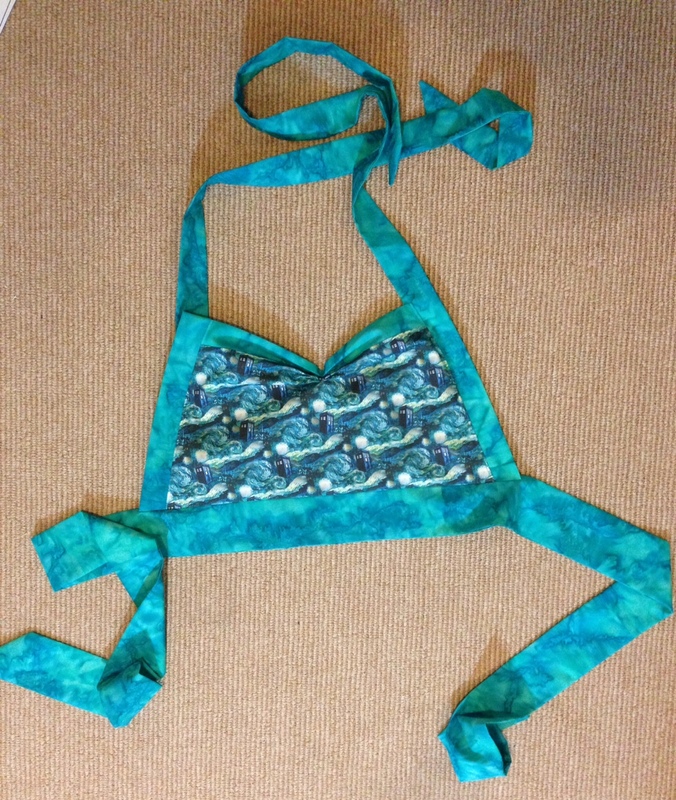 I was also thinking this could work as a swimsuit, with different fabrics. 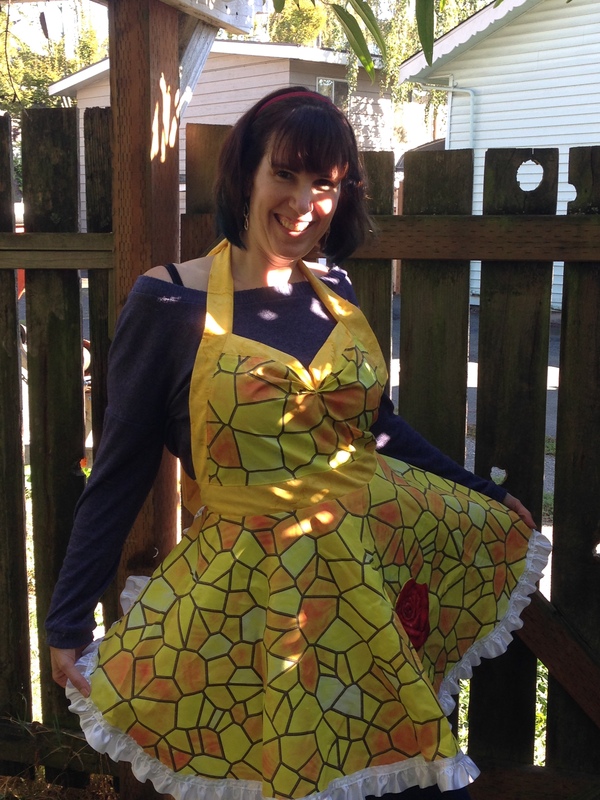 I got both halves put together and had my finished apron! 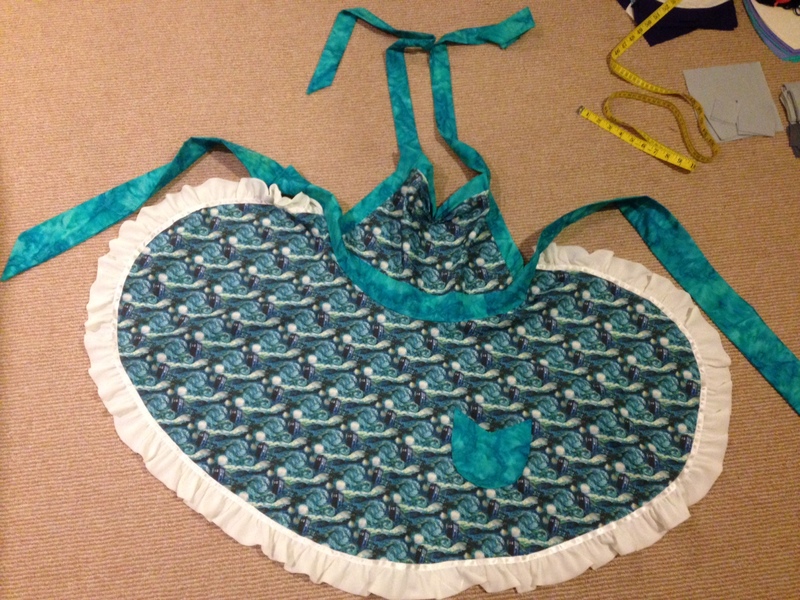 The problem with aprons is that they don’t look quite so fabulous laying down, so when I gave it to my friend, I took pictures of the apron being worn. And I taught Paul how to bevel.